Beautiful Leavenworth home one block South of downtown Leavenworth. Plenty of parking for your guests and an easy walk to all events in Leavenworth. Classically renovated with new landscaping, seclusion and room for twelve. Take a short walk to outstanding swimming at beautiful Barn Beach, and the rush of the Wenatchee River or head to the many hiking and bike trails in the Icicle Valley. Bring your family and friends to the friendly Bavarian Village and take in all of the opportunities of festivals, recreation or just relax in this secluded home. This is the perfect place for book clubs, scrapbooking or families coming to enjoy all Leavenworth has to offer. 35 miles to Stevens Pass or 40 miles to Mission Ridge for downhill skiing, or just minutes from Ski Hill and Cross Country skiing throughout the area. This is a great place for tubing the River. Put in at the bridge on Icicle and you can float down to Rivers Echo/Barn Beach. Great restuarants within walking distance, the Gypsy Cafe is right across the street and Der Hinterhof Family Garden is a half block away featuring great local talent at their location. Summertime is a great time to visit the local wineries or stop in at the fruit stands. Leavenworth has great farmer's markets and organic gardens that you can visit as well. The local Summer Theater is a great venue and Sleeping Lady has great events all year round. 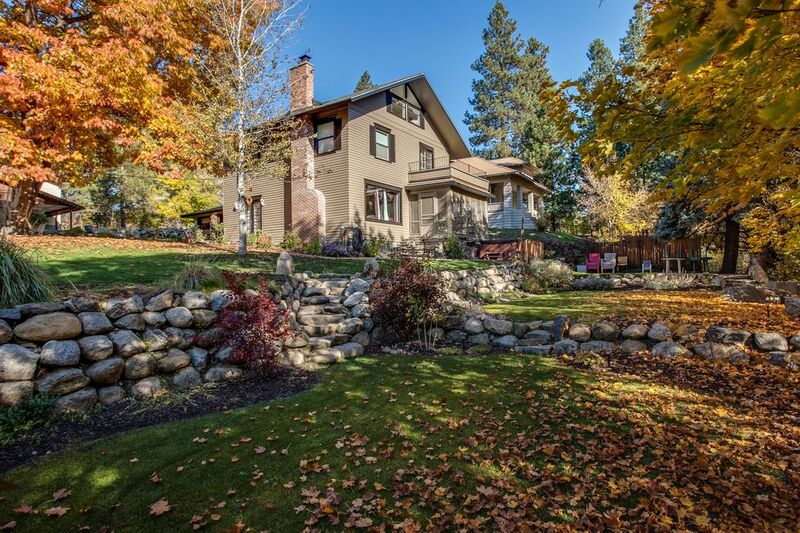 The opportunity to have a historic turn of the century home in a great location of downtown Leavenworth. This home sets where Main Street of Leavenworth once was. One of the first bankers in town had it built and the 4 stories, screened porch, and beautiful characteristics made us fall in love with this historic home. We put in our tubes at the Icicle Creek Bridge and float down to Barn Beach where we just walk up to the home after a day of floating the Rier. During special times or events in town, we are able to stay right downtown with plenty of parking and rooms for our family/friends to gather. We have hosted many birthday parties, wedding receptions, or just great get togethers. We are in the heart of Leavenworth..secluded..but one block away. The house was great and we had an amazing time! Thank you for sharing your home with us. Overall experience was spectacular. The home, location, communicating with the owner exceeded expectation. This is a beautiful home in an extraordinary location. We loved it and will return to this house every year. Highly recommend! Amazing location between downtown and park. Quiet, yet everything is just a couple blocks away. Great family vacation. This is our 4th time staying at Rivers Echo and we have lived it every time. The location can not be matched- once you park your car in the driveway, that easily fits 4 cars, you don’t need to get in it again until you leave. Restaurants & shops are just a short walk, hot tub on the property overlooking the ravine and plenty of space & comforts if you’re staying in. We had such a great time. The house is beautiful and so convenient to town. Walk to everything, watched the fireworks from the hot tub. Kitchen is well equipped, we wanted for nothing. This is a great place for tubing the River. Put in at the bridge on Icicle and you can float down to Rivers Echo/Barn Beach. Great restaurants within walking distance, the Gypsy Cafe is right across the street and Der Hinterhof Family Garden is a half block away featuring great local talent at their location. Rates based on 6 People, $25 per person extra over 6 people. Additional Terms: By booking with us, you agree to receive informative emails about our vacation properties. If you do not want to receive emails about our properties, deals and promotions, you can opt out at the bottom of your first promotional email. We will not sell or give your email to any other party.